In 2015, Texas was one of the most dangerous states for motorcycle riders. The state ranked third in the nation for the highest number of motorcyclist fatalities, with the Texas Department of Transportation reporting that 459 motorcyclists were killed and another 8,000 injured that year. These consequences are serious and life-changing for motorcyclists and their families. Too often, it is another person’s careless behavior that leads to these crashes, with the bikers left facing physical pain, emotional turmoil, and financial stress. However, motorcyclists have rights that can be protected after an accident. Despite facing some unique challenges, Hurst, Texas motorcycle accident victims can obtain justice and compensation that can help them move forward successfully with their lives. In Texas, the experienced Bedford, Texas motorcycle accident lawyers at Parker Law Firm fight to make sure that motorcyclists can obtain the compensation they need to recover physically, emotionally, and financially. For motorcyclists, another person’s negligence has serious, and even deadly, consequences. That’s why this dedicated legal team aggressively represents victims. If you or someone you love has suffered injuries in a motorcycle accident, you may be eligible to file a claim. Call Brad Parker’s Bedford office today or take a moment to fill out the online contact form to learn more. The National Highway Traffic Safety Administration (NHTSA) states that motorcyclists are 27 times more likely to be killed than drivers and passengers in other vehicles in road crashes, and more than 80 percent of motorcycle accidents result in death or injury to the motorcyclist. By their very design, motorcycles are inherently more dangerous than other types of vehicles. They lack seat belts, air bags, and the protective steel frame that a car provides. Additionally, they can be less stable than four-wheeled vehicles and are much more difficult to see on the road. While they can maneuver through traffic more easily, the capability of a motorcycle to speed up and slow down rapidly can also present risks. It can be difficult for other drivers both to see them and to respond to the motorcycle’s movements. When a collision happens, a motorcycle’s lack of safety features leaves drivers and passengers at risk for more serious injury. For motorcyclists, more than any other drivers and passengers, the risks on the road are real. They are vulnerable in many conditions, and the injuries they sustain are serious. If you or someone you love has suffered injuries in a motorcycle accident, the motorcycle accident lawyers at Parker Law Firm may be able to help. Call the Bedford office today to learn more about your rights. In a great many cases, other drivers claim they simply didn’t see the motorcycle. Regardless of what another driver may intend, when he fails to be careful and attentive behind the wheel, a motorcyclist should not have to suffer the consequences. While the goal of the Texas civil justice system is to offer impartial and fair decisions, it is sometimes impossible for people to completely set aside their personal beliefs and ideas. The human factor means that there are times when someone’s preconceived notions affect a legal case. 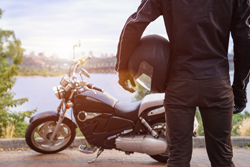 The experience of injured motorcyclists and their attorneys indicates that there is a real and incorrect perception that those who ride motorcycles are usually reckless. This bias is a problem because it can affect the evidence and testimony in a motorcycle accident case. When witnesses assume the motorcyclist was at fault, it may color their telling of events. A police report can be affected by this bias, which will carry over into court. Further, this bias often can be found when dealing with insurance companies and their representatives. Adjusters know that juries can be biased against motorcycle riders, and they will try to leverage the uncertain results of a jury trial against the victim in an attempt to protect the insurance company’s own bottom line. An experienced Hurst attorney understands this bias and the tactics of those who try to exploit it. At Parker Law Firm, the tenacious motorcycle accident attorneys will fight for to protect the rights of victims and ensure they are able to obtain the maximum amount of compensation available. If you or someone you love has been involved in a motorcycle accident, take action today to protect your rights. Call the experienced Bedford, motorcycle accident attorneys at Parker Law Firm at 817-503-9200 or take a moment to fill out our online contact form. You’ll receive a prompt response from a dedicated member of a legal team who will work tirelessly to help you ensure that you get the medical care you need and the compensation to keep your family secure. We have used the Parker law firm in the past and are always pleased with the professionalism and personal concern that is shown towards their clients. We would highly recommend their services. We particularly feel comfortable in their offices as they are local and not in an intimidating downtown glass office building. Please consider this firm if the particular need applies.